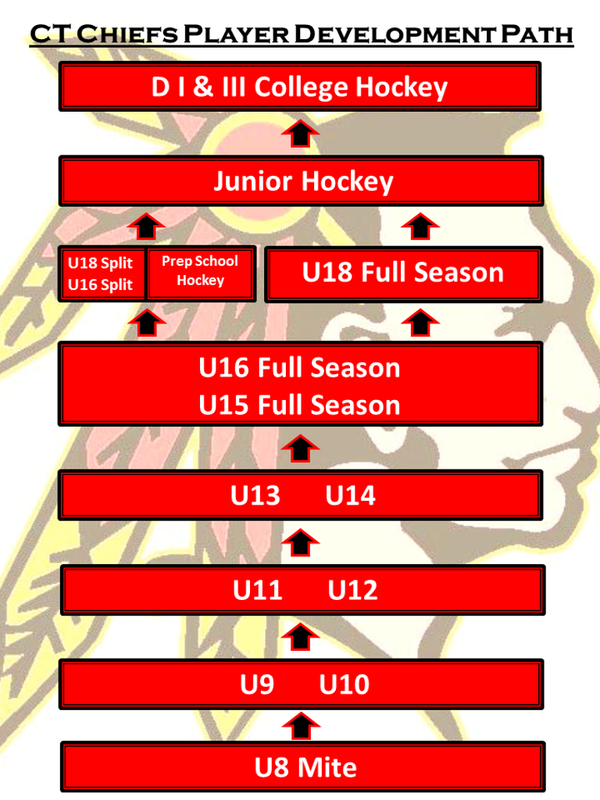 The U18 Full Season team will continue the Elite Skill Development & Player Placement the Connecticut Chiefs are known for in the hockey community.The Connecticut Chiefs have advanced over 305 players to Prep School, Junior, & College Hockey. The U18 Elite Full Season program will deliver an exceedingly competitive Tier I schedule within the Atlantic Youth Hockey League, Beast Showcase Series, and in high profile Tournaments and Showcases, ensuring exposure at both the College and Junior level. The Connecticut Chiefs extensive contacts throughout the College and Junior level will prove invaluable to each U18 Elite player focused on advancing to College Hockey. A native of Langhorne PA, Mike Tenney has been coaching hockey for 15 years. During his coaching career he has coached every level from Mite to the NAHL. Coach Tenney was recently hired to work as a scout for the NJ Titans in the NAHL. His primary role as a New England based scout is to identify young up and coming players that have the potential to develop, grow and move up the developmental path to the NAHL. Prior to joining the Chiefs, for the past two seasons for the Hartford Junior Wolfpack in the USPHL. With the Wolfpack he served as GM/ Head Coach of the Junior/Midget Program. Coach Tenney started in Junior hockey in the 2008-2009 season as an Assistant Coach and the Assistant General Manager of the Central Penn Panthers Junior team who won the MJHL and finished as the runners up at the Junior B National Championships that year. Moving from CPP to the Walpole Express the following year to become the Head Coach of their MJHL team and an assistant with the AJHL team, the Express won Three AJHL Championships, an MJHL Division Title and made 4 trips to the USA Hockey National tournament while Coach Tenney was a member of their coaching staff. After a stint in the Empire Junior Hockey League with the Islanders Hockey Club, Coach Tenney was instrumental in starting the Maine Wild Junior program, winning the Coach of the Year Award for the NSHL in 2013-2014 season. A promotion to the NAHL as Associate Head Coach of the Northeast Generals saw coach Tenney leave the Wild. The NAHL provided valuable experience in developing top level student athletes as well as learning how to scout and promote players to the upper echelon of Junior and College Hockey. In addition to Junior hockey, Coach Tenney worked as a part of USA Hockey in various roles including: USA Hockey Festival Coach, Atlantic District Team Leader, Yankee Conference U15 Coach, and CEP (Coaching Education Program) Instructor in the state of Rhode Island at the level 1, 2 and 3 clinics. Coach Tenney has worked directly with players at Midget, Tier III Junior and in the NAHL that have seen success moving to Professional, NCAA D1, and the NCAA DIII levels. He hopes that through his commitment to development and advancement he can provide exposure and opportunity for future players to create their own path to higher levels of hockey. Coach Tenney resides in Portland, CT with his wife Caitlin and twin daughters Madisyn and Lucy. ©2019 Connecticut Chiefs Hockey, LLC / SportsEngine. All Rights Reserved.